Home News & Opinion Will Gov. 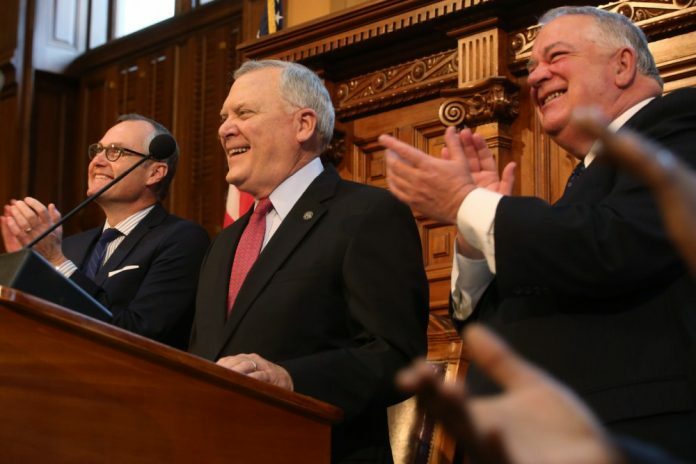 Nathan Deal become a lame duck due to his vetoes? The vetoes of Georgia’s “religious freedom” and “campus carry” bills sparked outrage within the ranks of the GOP. Could they turn him from loyal party man into a pariah? His defiant remarks came in response to being asked about the “campus carry” bill, a measure that would’ve allowed people to carry concealed guns on college campuses, which had languished on his desk during April. Sure enough, last Tuesday afternoon, he vetoed the measure, which sparked praise from the left and even greater outrage from the right. Of the 323 bills the General Assembly passed this legislative session, Deal vetoed 16, the most he’s rejected in a given year. Two of those—“campus carry” and “religious freedom”—have signaled a remarkable shift from a governor not known for ruffling feathers within the Republican ranks. Blocking two of his party’s top legislative priorities will, according to far-right lawmakers, turn the second-term governor into a lame duck earlier than expected. Since taking office in 2011, the governor has been willing to work across the aisle on issues like criminal justice reform, which has earned him praise from President Barack Obama, and a proposal to erect a monument of Rev. Martin Luther King Jr. that would replace the statue of Thomas Watson, the late Georgia politician and known white supremacist, removed from outside the Gold Dome in late 2013. On the other hand, the governor has backed anti-immigration policies, blocked Medicaid expansion, and insisted that Georgia not emulate Colorado’s marijuana laws. In a year of political extremism on the national stage, Deal has revealed himself to be a moderate Republican willing to break ranks with his party. On March 28, just three days after the end of the legislative session, Deal vetoed the “religious freedom” bill out of concern that it would legalize discrimination against LGBT people and lead to economic boycotts, as seen in North Carolina this spring. But he also laid out a conservative argument, quoting scripture as he questioned the need for further legislation regarding a right already protected by the U.S. Constitution. For his efforts, Deal was met with unprecedented vitriol from within his own party, while some Republican lawmakers, including state Sen. Bill Heath, called futilely for a special session to override the veto. In response to Deal’s “campus carry” veto, which cited legal precedents from Thomas Jefferson’s day, state Rep. David Stover, a Newnan Republican, last week declared on Facebook that the decision was “further proof that the state of Georgia, in modern history, has never elected a true Republican governor.” On the radio, state Rep. Kevin Cooke, a Carrolton Republican, proclaimed that Deal’s vetoes epitomized the political double-speak that has frustrated conservatives across the nation. Deal, however, caught a break from the ever-changing news cycle. Just a few hours after his “campus carry” veto was released, Republican candidate U.S. Sen. Ted Cruz dropped out of the presidential race after a shellacking in Indiana, conceding the party’s nomination to Donald Trump. It’s a threat that could come back to haunt Deal as he carves out his legacy in his final two years in political office.